AMD’s resurgence in the high-end desktop scene has apparently sparked a fire under Intel. The chipmaker, which has stood unchallenged atop the performance desktop mountain for years, is reportedly working on a potent lineup for its X299 platform that includes an 18-core monster. Update: And they are official! 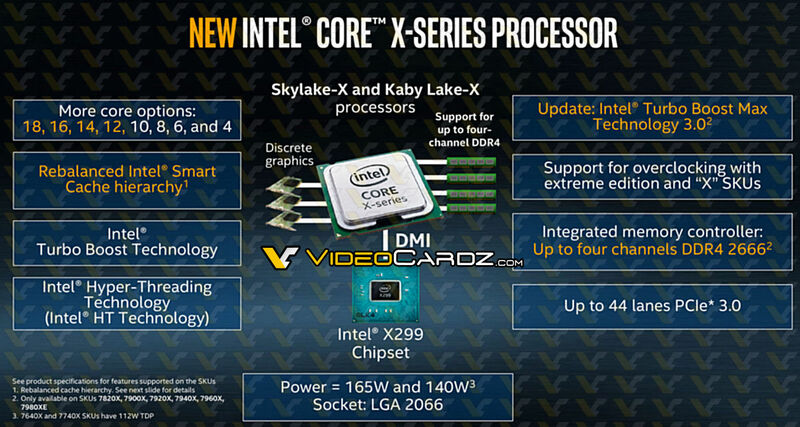 Check out Intel's confirmed Core-X and Core i9 lineup here. According to VideoCardz, which says its intelligence was obtained from multiple sources, the Intel Core i9-7980XE will be the new performance king with 18 cores and 36 threads (other details like L3 cache size and clock speeds wasn't shared). There’s also said to be a Core i9-7960X with 16 cores / 32 threads and a Core i9-7940X with 14 cores and 28 threads in addition to the stable of chips we’ve previously heard about. Intel even reportedly has new boxes in the works as spied above. As we learned earlier this month, AMD is also gearing up for an epic battle this summer with its Ryzen 9 “Threadripper” chips. That lineup, if you recall, is said to be capped by the Ryzen 9 1998X, a 16-core / 32-thread beast with a base clock of 3.5GHz (Boost to 3.9GHz), quad-channel DDR4 support and access to 44 PCIe lanes. That chip, along with the 1998, will carry a 155W TDP, rumors indicate. Some expect Intel to announce its new X299 platform as early as next month although as always, rumors of this nature should be taken with a grain of salt until we hear official word from the horse’s mouth.